A family travel website is understandably the last place you might expect to find it. Nevertheless, this post is dedicated to the rugged, windswept coastline and green hills of Cape Breton Highlands National Park in Nova Scotia, Canada. Whether you visit with your children or without, it may be hard not to be drawn in by the dramatic and romantic beauty of Cape Breton Highlands’ landscape. I visited Cape Breton Highlands National Park on a romantic getaway in Nova Scotia with my husband. It was June, just before high season and just a little cool. We saw more empty nesters than families in the park, but Cape Breton Highlands’ short trails, beaches, abundant wildlife and gorgeous scenery would be fun with or without the kids. If your family is up for a road trip, this is a great summer destination. 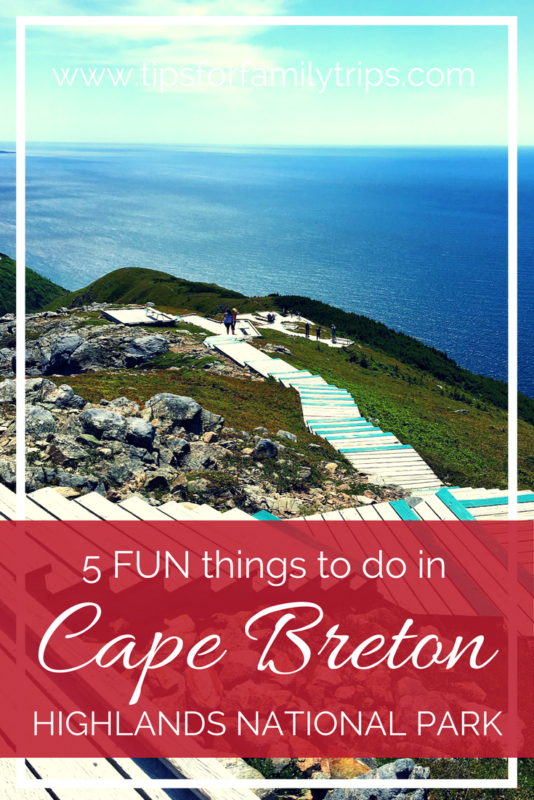 Here are our favorite things to do in Cape Breton Highlands. The Cabot Trail is a world-famous scenic drive that loops the upper part of Cape Breton Island, Nova Scotia. It was the one of the biggest reasons we decided to visit Cape Breton Island, and we were not disappointed. The two-lane road hugs the rugged coastline, offering fantastic views of the wild green hills of Cape Breton Island and the vast blue scape of the Atlantic Ocean on the east and Bay of Fundy on the west. The Cabot Trail and Cape Breton Highlands National Park are inseparable. You must drive the Cabot Trail to reach Cape Breton Highlands and you can’t complete the trail without visiting the park. Once you start driving the loop, you either need to finish or reverse your course because there are no short cuts or alternate highways through this rugged and rural area. The Cabot Trail is 298 km (185 miles) long. We saw the highlights of Cape Breton Highlands National Park and drove the entire Cabot Trail in one full day. Many visitors choose to spend more than one day on the Cabot Trail and book lodging in or near Cape Breton Highlands National Park. You’ll find small inns, resorts, campgrounds and vacation rentals all along the Cabot Trail. What you will not find are well-known hotel or restaurant chains. It just adds to the charm of all the small towns along the trail. We booked a secluded beach house on the Atlantic, about halfway between Baddeck and Ingonish. It’s “Ocean Front Cottage on Cabot Trail” on AirBnB.com. It was large enough for a family, but cozy enough for our anniversary trip. The Skyline Trail is perhaps the best known and most popular hike in the park. It was the highlight of our day in Cape Breton Highlands National Park. Most of the trail is level and forested, with occasional benches for a rest or a snack. It’s 7 km (4.3 miles) round trip. You’ll be rewarded at the end of the trail with panoramic views of Cape Breton Island and the open water to the west. A long series of wooden stairs descends down the cliff. There are several platforms with benches along the way. We walked all the way down and enjoyed the view for some time. It was so windy on the day we walked down the Skyline Trail cliffs, I worried slightly about being blown off my feet. Hang on to your kids and hats on this section of the trail. A local couple who had hiked Skyline many times sat near us at the end of the trail. They said that they had spotted whales here before, but we were not so lucky that day. Nevertheless, I rank the Skyline Trail among the best trails I have hiked for its gorgeous scenery alone. Skyline Trail is only one of about two dozen hikes in Cape Breton Highlands. We enjoyed several other short hikes during our visit. Driving your own car is the best way to get around Cape Breton Highlands National Park. We booked our rental car through Budget with their Pre-Pay discount. You may see wildlife throughout Cape Breton Highlands National Park, including whales, black bears, moose, coyotes, bald eagles and more. We spotted many of these along the Cabot Trail. My most memorable wildlife sighting was one of the few animals I didn’t want to see up close. We had read about the park’s coyotes prior to our trip, and saw warning signs at the beginning of the Skyline Trail. We knew that a couple of visitors had been bitten by coyotes and one lone hiker had been killed in recent years. In my experience, most wildlife – especially large predators – stay hidden on trails as popular as this one, so I wasn’t worried. Nevertheless, we came face to face with a big Eastern Coyote just before we emerged from the forest to the open cliffs. The coyote would have been at least my height if standing on his hind legs and he appeared just a few feet from us, on the side of the trail. We looked at him. He looked at us. Then he calmly turned and trotted down the trail in the opposite direction. The experience was both thrilling and terrifying. Thousands of people hike the Skyline Trail every year and wildlife injuries are rare. Be sure to read safety guidelines on the Cape Breton Highlands website and share them with your family to help ensure that wildlife encounters will be nothing more than an exciting story to tell after your trip. Any summer vacation on the coast HAS to include a trip to the beach – especially with kids. Cape Breton Highlands has several salt water and fresh water beaches to choose from. It was not beach weather during our visit, and time was short so we didn’t spend much time on the park’s beaches. Click HERE to learn more about popular beaches in Cape Breton Highlands National Park. There are a handful of restaurants just outside the borders of Cape Breton Highlands National Park, but I recommend packing picnic supplies, or at least snacks. You can’t expect to happen upon a restaurant at exactly the time you need one, and there are so many great places in the park to enjoy a picnic. Consider stocking up at a supermarket before you reach the Cabot Trail. You’ll find a handful of small markets in towns along the trail. We did stop at the Chowder House in Neils Harbour for a light meal. The seafood chowder was as good as billed for a reasonable price. Many of our fellow diners ordered the whole lobster, which was in season during our June visit. There is a cute little lighthouse nearby and the views are lovely. Cape Breton Highlands National Park was worth the trip. We love maritime climates and scenery in the summer, and it’s kind of fun to visit a place that few people in our social circle have seen. Cape Breton Highlands exceeded our expectations and I enthusiastically recommend it for a family summer vacation or romantic getaway. Where: The far north end of Cape Breton Island, Nova Scotia. On the Cabot Trail. Enter near Ingonish or Cheticamp. When: You can drive through the Cape Breton Highlands year round. The park’s operating season is mid-May through late October. How Much: All of Canada’s National Parks are FREE in 2017. Expect to pay a few dollars per person in 2018 and beyond. Check current rates HERE. Amenities: Visitor’s centers, restrooms, picnic areas, parking, campgrounds. Lodging and dining are available nearby. Need a place to stay? We booked a cozy beach cottage on the Cabot Trail through AirBnB. See it HERE. Need a rental car? Driving your own car is the best way to get around Cape Breton Highlands National Park. We booked through Budget with their Pre-Pay discount. Want to save money on your Nova Scotia vacation? Get my FREE e-course 7 Ways to Save BIG on Your Next Vacation. Learn more HERE. I was born and raised in Nova Scotia, and am currently enjoying the rain-threatened breeze here in my province right at this moment. But as long as I live the Bay of Fundy is NOT near Cape Breton Island. Look on a map. It’s in between Annapolis Valley and the bottom of New Brunswick and cut off by Amherst before it ever gets near Cape Breton. I’m not sure what you thought you were looking at on the Skyline Trail, but it wasn’t the Bay of Fundy. Glad you enjoyed Nova Scotia though!